Community Environment Grants of between $5,000 and $50,000 are now available from the Australian Government to community groups working to achieve an environment that is healthier, better protected, well managed and resilient. Funding is available to established and emerging groups currently operating in the environmental sector, including Indigenous organisations. 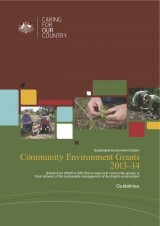 Individuals are not eligible to apply for Community Environment Grants.